HMS Barham was one of five battleships of the Queen Elizabeth class. Commissioned in August 1915 during the First World War and received six hits during the Battle of Jutland. During the Second World War HMS Barham was on duty in the Mediterranean where the Type VII U-boat U331, commanded by von Tiesenhausen, was also on patrol in November 1941. Tiesenhausen sighted three British battleships, HMS Queen Elizabeth, HMS Barham and HMS Valiant, acompanied by eight destroyers. U331 fired four torpedoes, three of which hit HMS Barham. The battleship sank in less than 3 minutes taking 862 men with her. Just 449 survived the attack. Meanwhile HMS Valient spotted U331 on the surface and attempted to ram the U-boat. U331 immediately dived but lost control and sank to an incredible 820 feet (250 metres) - the recommended safe diving depth was 330 feet (100 metres) and the maximum crush depth of the Type VII was 650 feet (just under 200 metres). U331 regained control and survived. 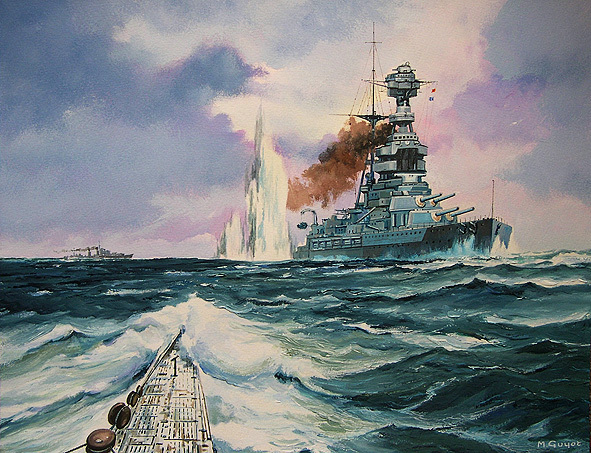 Only three British Battleships were lost during the entire Second World War: HMS Barham, HMS Royal Oak and HMS Prince of Wales.